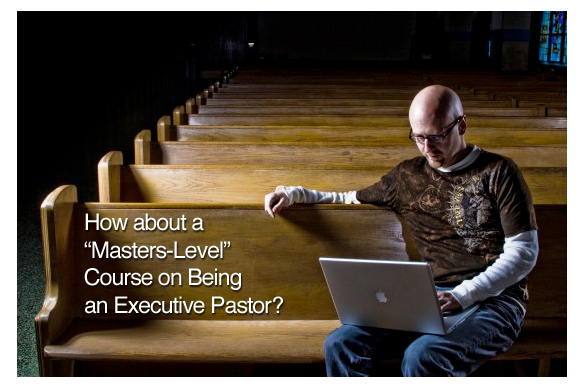 How about a “Masters-level” course on being an executive pastor? It will be personal. Highly practical. Intensive. Relational. Collaborative. Think less conference or workshop–and more hands-on graduate study program. We will drill down on building teams, hiring and firing, developing a healthy staff culture, leading change, budget and money issues, communication strategies and more. If you are interested, there is good news and bad news. The good news: Registration is open now, and if you act quickly, there is a good chance you can be involved. But here is the bad news: This may be the last one held at Granger and hosted by and with the Granger team. Once these 12 slots are gone—the network will be closed. I’m really praying that God will put together an amazing group and can’t wait to see what happens! Not an executive pastor but still looking for insight and practical wisdom in your area of ministry? Need to be stretched, challenged and encouraged? Good news! If you're involved in communications or connections, we also offer intense, practical and personal training for you. Download the Communications or Connections & Assimilation Coaching Networks information to find out if either of these is right for you. Many years ago we hired a guy to lead an important part of the ministry. He had all the right qualifications and was a joy to work with most of the time. But something that didn’t show up on his résumé or in any of our reference calls was that he had a temper. About two months after he started, he got upset at a meeting and threw a table across the room as he stormed out. We gave him a warning, but it was only a couple weeks before he got angry again and cussed out a volunteer loudly and publicly. This guy had a gaping character flaw, and we had to let him go. 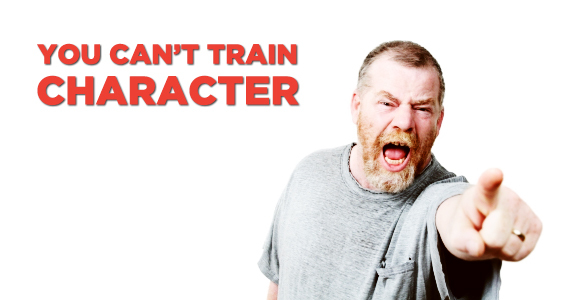 For church leaders, choosing people of character can be a bit difficult for us. Why? Because we are the church. It is part of our business model to help pick up the pieces for people. It is our intention to be there when people fall so we can point them to Jesus and help get them back on their feet. If people in our church have addictions or bad habits, or if they engage in damaging behaviors, we don’t kick them out of the church. We meet them where they are and help them take their next steps. But when we are talking about volunteers or staff leaders, whom we have brought on the team to help others take steps, it is important that there aren’t any debilitating character flaws that will cause others to stumble. This can be misinterpreted by some to mean that only perfect people are allowed on the team. Nothing could be further from the truth. We don’t want to encourage that kind of thinking or put that burden on our staff. Everyone is dealing with something. Everyone has an area in his or her life where he or she needs help and support. All of us deal with the reality of our humanity, and we are constantly striving to lean on Jesus. But it’s crucial that the people we bring on our team do not have huge flaws in their integrity that could cripple their ability to lead. Luke 12:48 says that more is required from those who have been given greater responsibility. 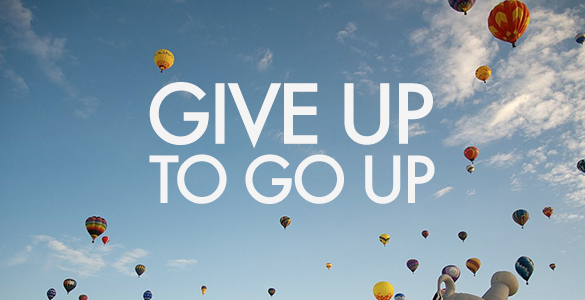 “You have to give up to go up.” I first heard John Maxwell say this in 1993 in a small leadership conference in Anderson, Indiana. Nearly 20 years later, I couldn’t agree more. Many of you are pastors, the top dog in your church. You’ve either started the church from scratch, or you’ve come into an existing ministry. You want your church to grow. 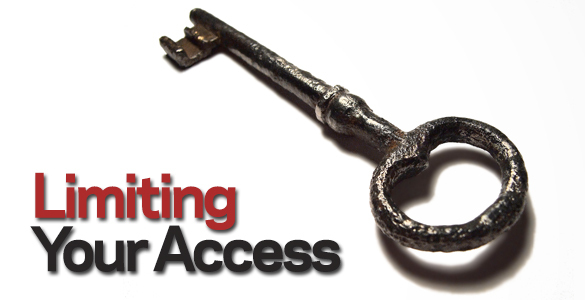 You may be looking for ideas to give your church a jumpstart. Or perhaps you’ve implemented changes, and the church is starting to grow. Now you want to take it to the next level. Have you heard about our One-Day Workshops? These are intense and focused, interactive learning environments that your whole team can take advantage of. Get away for one day and join us at Granger Commons on Friday, April 25 to learn more about First Impressions, Communications and Kids’ Ministry. Then stay with your team for the Arts All-Access workshop on Saturday, April 26 where you’ll go behind the scenes and attend the Saturday night service. 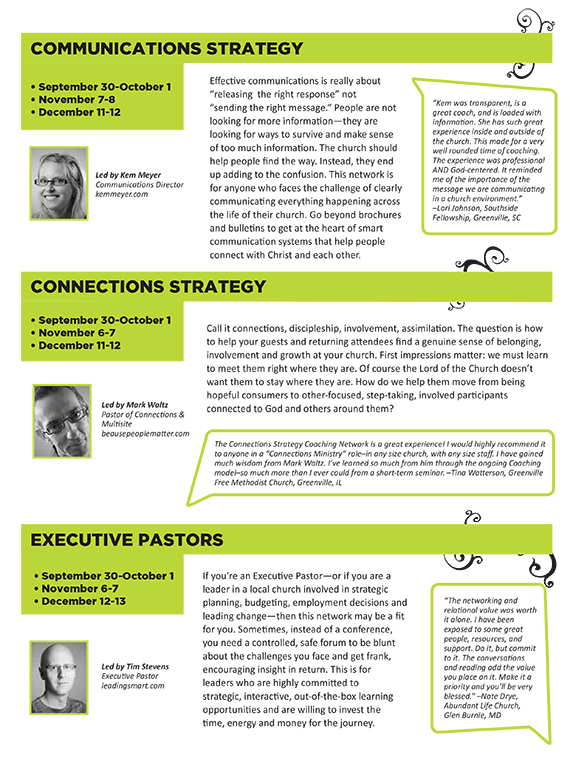 The next Executive Pastors Coaching Network begins in February. You might not be called an “executive pastor” at your church, but if you are involved in strategic planning, budgeting, employment decisions and leading change—then this is a learning community designed for you. There are only 12 slots available—and nine of them are already reserved. Already leaders from Kentucky, Indiana and North Carolina have registered for the spring network. If you know a leader or pastor who would be ideal for this learning community, let them know registration will be open until it fills up. 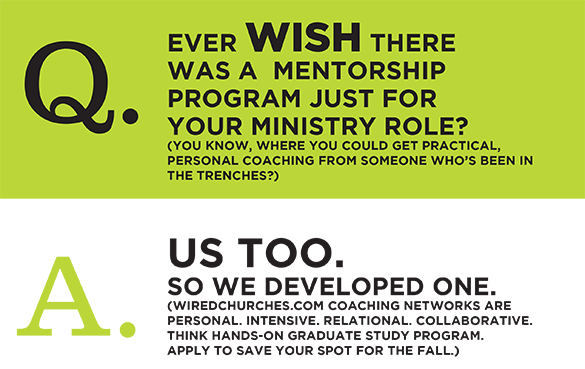 Get more information, and register for a coaching experience that could change the trajectory of your ministry at WiredChurches.com. “Discipleship” is the new rage. Every church conference seems to be focused on discipleship. Every leader is trying to figure it out. Every church member is asking, “What does this church offer for discipleship?” And every pastor is leaning in to figure out what it is, how to measure it, and what they are responsible for. And I’m included in that list. I’m joining more than 5,000 leaders in a few weeks at the Exponential Conference called “DiscipleShift.” The topic is so popular that the conference sold out weeks ago (you can still tune in to the free webcast). I wonder if sometimes we over-complicate the issue. Have you seen the new AT&T ad campaign where a bunch of little kids sit in a circle and answer questions? They say something crazy or off-the-wall, and the narrator follows up, “It’s not complicated.” I think we need a little dose of childlike thinking regarding discipleship. Sometimes we get so mired in the nuances of our argument that it paralyzes us from getting anything done. We sit around arguing the when, where, how and what–and we fail to inspire people to get on the path and start moving. A disciple-maker is intentionally taking someone else along for the journey. A mature disciple doesn’t require anyone else to continue taking steps with and toward Jesus. I really enjoy following the blog of David Whiting. He is the pastor of Northridge Church in Rochester, New York. This is a pastor who understands hard work, church growth, discipleship, and leading his family with integrity. I know you’ll enjoy his blog. I’ve determined at this point of my life to only give up three nights a week for church-related meetings. I am doing all I can to be home four nights a week. I am in the final years of parenting teenagers. I want to do it well. It can’t be done well without presence. So smart. Many pastors won’t draw this line. They buy in to the lie that the church needs them more than their family does. Nothing could be further from the truth. The strength of your leadership comes from your strength at home. As a pastor’s kid at Granger Community Church, I have been part of the church my entire life and have grown so much in the time I’ve spent here. I grew up going to class in the Arts Room before it was the Arts Room, waving palm branches up and down the aisles of “big church” on Easter Sunday, and attending the “Fall Festival” on Halloween every year instead of trick-or-treating. The church helped to raise me and the teaching I learned became the foundation on which I based my faith. Sometime in high school, however, I started trying to figure out things for myself. People who had never stepped foot in GCC were giving me their negative opinions of it everywhere I turned, and although I’d been hearing them my entire life, I started listening and believing the things they were saying. On top of that, I decided that I didn’t like the “perfect pastor’s kid” title I had created for myself; I didn’t want to be the girl everyone wanted their daughters to grow up to be like, because those expectations felt too high and too impossible for me to reach.